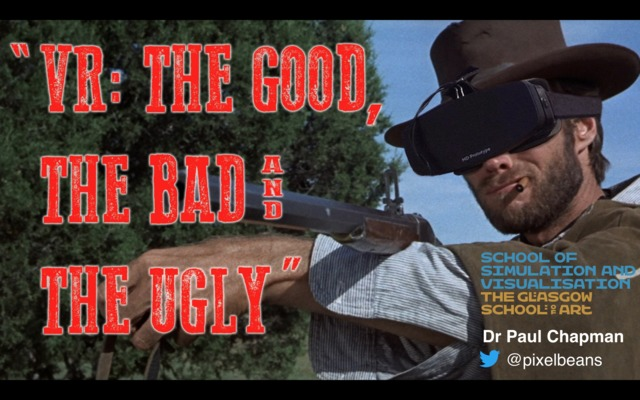 Chapman, Paul (2017) VR - The Good, the Bad and the Ugly. In: Digital Cities: Glasgow 2017, 17 March 2017, BBC Scotland. Everywhere we look we see the resurgence of VR which, in the last 24 months, seems to have become ubiquitous within our society. Even the mannequins in the shop windows, clad in the latest fashions, have HMDs strapped to their heads. VR is everywhere, from classrooms to therapy couches to TV adverts and bargain buckets in the local petrol station. VR is being pushed as the modern-day panacea for all our ills and commercial challenges. We’ve been here before and this time we’re in a much stronger place from a technological point of view but there’s still so many improvements we can make and pitfalls we must avoid. We must be mindful not to force the square VR peg into the real world round hole; VR really isn’t for everyone. In this talk I’ll touch on the wonders of VR, the good. But I’ll also talk about the pitfalls, the bad and the ugly. What do we need to watch out for? What are the real negatives of VR both from a social and physiological perspective? And importantly, what advances are we likely to see in the coming years.